Pulao is a rice dish prepared with cooking by rice, vegetables, whole spices and some powdered spices. It is also the one most commonly on the menu for parties like birthday, marriages and other parties. Pulao is actually a very versatile one and different people have different ways of preparing it. Veg pulao is a very comfort one pot meal. Some people cook the ingredients separately and then toss them together, others cook it all together. 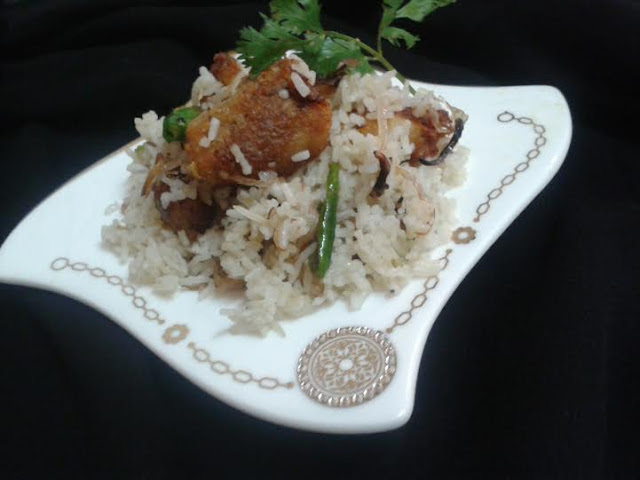 Here i am sharing a very unique and interesting pulao, crispy masala fry arvi pulao. the delicious arvi pulao best goes with raita and tomato salsa. पुलाव एक आसान सी चावल की डिश है जिसे तरह- तरह के सब्जियों के साथ कुछ खड़े मसाले और नमक के साथ बनाया जाता है, अक्सर पार्टीस में भी सर्व किया जाता है. पुलाव को सभी लोग अपने- अपने तरीके से बनते हैं, कुछ लोग मसालों, सब्जी और चावल को एक साथ बनाते हैं तो कुछ लोग अलग- अलग. पके हुए चावल, तली हुई प्याज़ और तली हुई अरबी डालें, हलके हाथों से चलाकर सभी चीज़ों के एकसाथ मिलाकर गैस बंद कर दें. Whole black cardamom 2 nos. Boil arbi in pressure cooker for 1 whistle, cool and peel the skin. press the arvi with your palms. keep aside. Wash and soak the rice for 15 minutes..
Take a large mixing bowl, add 2 tsp salt, red chili powder, curd, lemon juice, garam massala powder, carom seeds and cornflour mix well, keep aside for 5 minutes. Heat the oil and fry the onion till golden and crisp keep aside. Now fry the marinated arvi in remaining oil till it become golden and crisp, this will take about 5 to 7 minutes. Heat a heavy bottom pan, heat the ghee, when the ghee become hot lower the flame add whole spices- cumin seeds, cardamom, green cardamom, cloves, let the spices crackle. Add rice season with salt, add 1 tbsp lemon juice stir and mix well together all the spices and salt, add 2 cup water, adjust the water depending on rice quality. Now heat the butter in a non stick pan add 1/2 tsp cumin seeds, let it crackle now add cooked rice, fried onion and fried arvi mix gently together, cook for 2 minutes and switch off the flame. 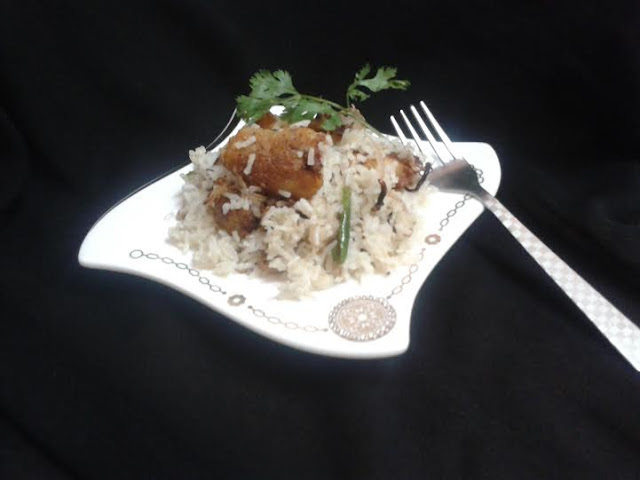 Garnish with fried onion, green chili and coriander leaves.